The Sinn Féin and Fianna Fáil leaders. 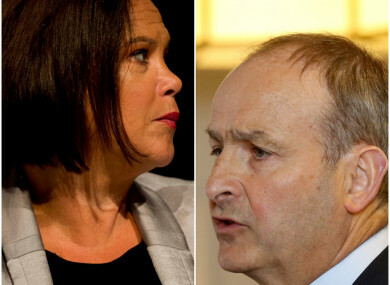 MICHEÁL MARTIN HAS described Mary Lou McDonald’s speech at the Sinn Féin Ard Fheis last night as “extraordinarily arrogant”. The Fianna Fáil leader said this afternoon that the election of TDs does not give any party “an entitlement to government” and that this must be earned. Speaking on RTÉ’s This Week programme, Martin said that he did tune in to McDonald’s address yesterday evening. “I did watch the speech last night, I think it was a flat speech, I think there was an absence of substance,” Martin said. There was no radical proposals or solutions contained within the speech. And there was a sense of entitlement that somehow Fianna Fáil or Fine Gael owed Sinn Féin power. “There is this sense from Sinn Féin and Fine Gael that they’re all talking about power, getting in to power. And not focusing on the key issues and challenges facing the people of the country,” Martin claimed. In her Ard Fheis speech last night, McDonald criticised both Martin and Taoiseach Leo Varadkar, accusing them of seeking to “exclude” Sinn Féin from governing in the south. “I invite them to wake up and smell the coffee. To realise that Irish political life is no longer dictated by them, it is no longer their way or the highway,” McDonald said. We are here, we are equal. Our democratic mandate and more importantly the people who vote for Sinn Féin will be respected. It is not for Leo Varadkar or Micheál Martin to decide whether or not we enter government. That decision will be made, in the first instance by the people. McDonald delivers her speech in Belfast's Waterfront Hall. In response to that namecheck today, Martin said that winning seats does not mean a party deserves to be in government. He added that the “serious issues” he has with Sinn Féin have not dissipated since McDonald became leader. “I certainly think it’s an extraordinarily arrogant proposition from Mary Lou that somehow someone owes Sinn Féin government. We don’t,” Martin said. Just because you change the podium, doesn’t mean you change the party, or the substance of the party. And I’ve made it very clear from the outset that we have very clear and serious issues with Sinn Féin as a political party. There had been suggestion during this week that Sinn Féin was planning to table a motion of no confidence in Housing Minister Eoghan Murphy, but the party decided against it. Such a motion would put strain on the confidence and supply agreement between Fine Gael and Fianna Fáil which is underpinning Varadkar’s minority government. Asked about this, Martin was critical about what he said was the “hype and credibility” surrounding talking of the no confidence motion. Email “'Flat and extraordinarily arrogant', Micheál Martin's verdict on Mary Lou McDonald's speech”. Feedback on “'Flat and extraordinarily arrogant', Micheál Martin's verdict on Mary Lou McDonald's speech”.